Brakes, they make you stop, simple huh? Well, do you know how many things affect your brakes? Do you know when you push down on the pedal, you push fluid through the lines to the calipers or wheel cylinders and they compress or expand causing the rotors or shoes to stop the rotors or drums and in turn stop the wheel? That means there are a lot of parts working on stopping your vehicle. If you’re having problems with any of them, you need to get to Elkhart Mechanics and have them give your braking system a once over. They’ll check for brake pad wear and make sure your rotors still have plenty of life left. You don’t want to hit the pedal and have nothing so get to Elkhart Mechanics today. You never think about your brakes when they are working well, but faulty brakes can make driving very dangerous, especially if there is rain, snow, or ice involved. 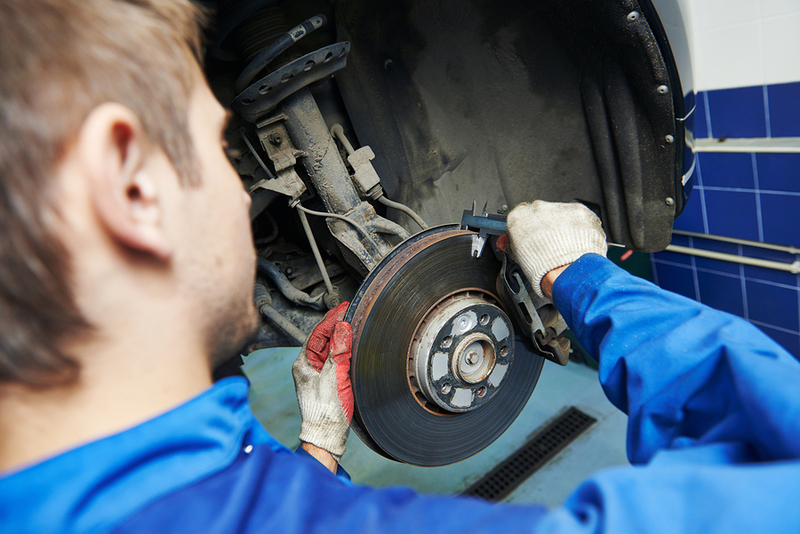 All kinds of things can go wrong with your brakes, and Elkhart Mechanics can help you with all of them. Sometimes the problem is simply that your brake fluid is low. Unfortunately, this sometimes also means that your brake system is leaking, and part of it needs to be replaced. Your first sign of a brake fluid leak might be that your brake light comes on. If your rear drum brakes or shoe adjusters are rusted, it may result in a low brake pedal. This can be fixed by replacing the shoe adjusters or rear drum brakes. If your brake pedal feels soft, it could be because of air in the brake system, low brake fluid, or a faulty rubber brake hose. If the brake pedal sinks to the floor when you are stopped at a red light, it could indicate a leak in the hydraulic system, or it could mean that the master cylinder needs to be replaced. If you feel pulsation when you press the brakes, it could mean that the brake rotor is warped. If your brake pedal feels too hard, the problem is probably the brake booster or the vacuum hose connected to it. If the brakes drag, the problem might be with the springs or pistons. If your car pulls to one side when you press the brakes, it means that one of the front brakes is not working. Faulty brakes are also notorious for making noises. If the brakes make a scraping noise, you probably need to replace the disc brake pads or the shoes of the rear drum brakes. If they squeal, the problem is probably the brake pads. A chattering noise indicates warped rotors.